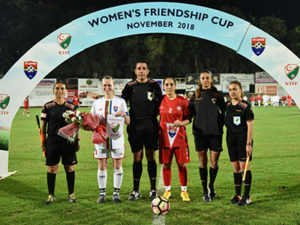 The first ever CONIFA women’s match took place when Northern Cyprus hosted FA Sapmi on Saturday 10th November 2018. 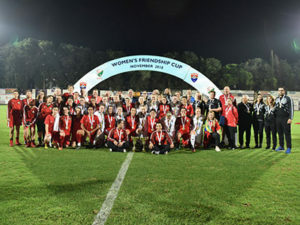 The match was billed as the ‘Women’s Friendship Cup’, and there was a friendly atmosphere ahead of the game, with the two teams even having lunch together on match day. The teams were welcomed out on the pitch by a loud home crowd at a packed Temmuz Stadium in the Northern Cypriot capital of Kyrenia. But the home crowd, and those watching the match live on TV, had to see that it was the guests from the very north of Europe that took the initiative from the start. 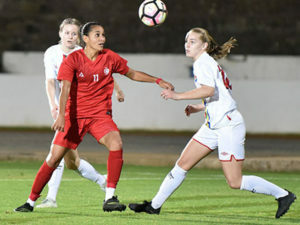 Several good chances were wasted or saved by the Northern Cyprus goalkeeper before Sigrun Linaker Dybek broke the deadlock after 27 minutes. A nicely executed finish saw the visitors take the lead, but even though they kept piling on the pressure, the Northern Cyprus defence held firm. A strong defensive effort saw the teams go into the dressing room at half time with the score still 1-0. Across the second half, the pressure would eventually be too much for Northern Cyprus. Emilie Kristensen put Sapmi 2-0 up just before the hour mark, and Sandra Simonsen added the guest’s third after 65 minutes. The match died down a little after that, but in added time Christina Elise Blind padded the scoreline by notching her first and Sapmi’s fourth of the evening. There were no hard feelings after the match as both teams were all smiles. Both teams were given medals and Sapmi got their first piece of silverware for their trophy cabinet.